I love all type of Paratha. Adding vegetables are more healthier than plain paratha.I made this paratha for my Sweety daughter. 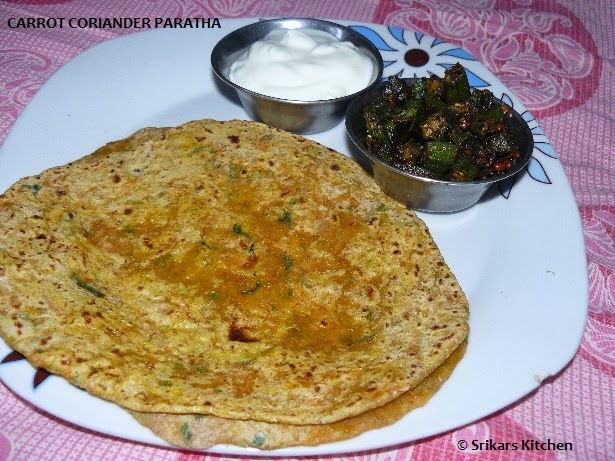 she loves chappathi but not veggie.So i prepared carrot coriander paratha for her. She loved it. Mix all ingredients with little water & make a soft dough. Rest the dough min 10 mins. Heat the tawa, take a small portion of dough & dust it. Flatten it using rolling pin & cook both sides until golden brown. Serve hot with Raitha or Any Subzi. Different version of parata . Delicious . event announcement - lets cook for christmas. This is really healthy paratha with carrot and coriander. Healthy n easy to make fr dinner specially..